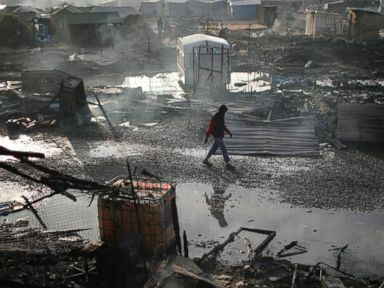 Children in the Jungle migrant camp in Calais, France, are living in unsafe conditions and are at risk of being trafficked by human smugglers as they wait to learn whether they will be taken to the United Kingdom, humanitarian organizations warn. The process of registering the children and sending them to the U.K. should have been completed before demolishing the camp, the organizations say. “We do know it is an environment where people smugglers do operate, and outside the humanitarian center, children are exposed to potentially being trafficked by some fairly shady and unscrupulous characters,” said Laura Padoan, a spokeswoman for the U.N.'s refugee agency, the UNHCR, which is assisting the U.K. in identifying unaccompanied children and registering them. “It’s critical that safeguards are in place. Currently, we feel that it’s not being done, but we do have protection staff on the ground ready to support,” she told ABC News. On Oct. 10, U.K. Interior Minister Amber Rudd made a commitment to send as many children as possible to the U.K. with close family ties in the country before the closure of the camp. She also said she would transfer unaccompanied refugee children from Calais to the U.K. who meet the criteria of the 2016 Immigration Act’s Dubs Amendment, which calls on the U.K. to take in 3,000 unaccompanied children from across Europe. Since she made the commitment, the U.K. has transferred nearly 200 children, including more than 60 girls, many of whom are at high risk of sexual exploitation, she said on Monday. But the U.K. is far from done with the process. The country expects to accept hundreds more children and still has about 1,000 children left to interview even though demolition of the camp has begun. This means that unaccompanied children who have been registered and are staying in the safer humanitarian camp are witnessing harsh scenes. 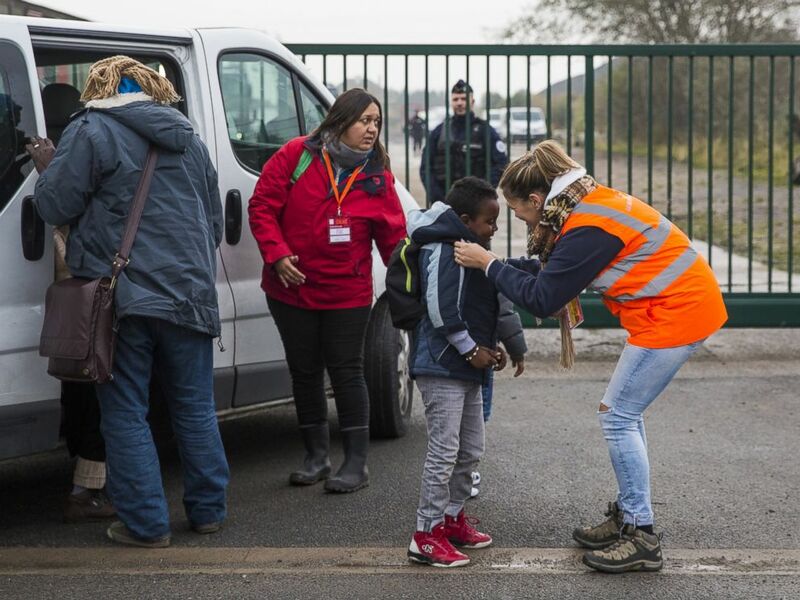 Care workers bring child migrants to a reception point outside the "Jungle" migrant camp before boarding buses to refugee centers around France, Oct. 24, 2016, in Calais, France. “The demolition of the so-called Jungle camp is happening around the humanitarian camp where the children who have registered are residing. I can only imagine that it must be extremely frightening if you are a child who is being surrounded by the chaos of the dismantling, wildfires, riot police and people with the intention of creating tensions with the police,” said Padoan. Children who have been registered and are staying in the humanitarian camp sleep in white shipping containers with room for 12 people, said Lliana Bird, a co-founder of Help Refugees, a humanitarian organization that was formed in September 2015 in response to the crisis unfolding in Calais. Other children haven’t been able to register yet and don’t have a place to sleep in the meantime because their shelters have been destroyed, she said. “We are urgently saying that there are hundreds of unaccompanied minors with no safeguarding and nowhere to sleep tonight. They must be brought to safety immediately. Ideally, there’ll be youth workers and safety workers there,” she told ABC News. “On Monday registration didn’t occur all day, and today it stopped at 12:15, so children who didn’t get to register in time were told they had to go back and sleep in the camp. But the camp is on fire at the moment, and many had their shelters dismantled and don’t have a place to sleep tonight,” Bird said, adding that trafficking is another big risk children face because they are on their own in the camp. “Children should not be brought over during this distressing time. It’s all happening last minute and should have happened much earlier. Any chaotic or distressing situation going on around children who are already vulnerable makes them even more vulnerable and more open to abuse,” she said. On Monday, Rudd said that in some cases children who were supposed to board a bus to go to the U.K. didn’t show up, raising concerns. “Over the past few days, there have been cases in which we have expected children to be available to board the bus to come to the U.K., and sometimes nongovernmental organizations themselves have been surprised not to have been able to find them,” she said speaking to the U.K. Parliament on Monday. She declined to comment further on the issue of children’s not showing up. During a question session with Parliament, Rudd addressed why the U.K. didn't start the process of interviewing and registering children in Calais earlier. “My officials were given access to the camp to interview children only in the past week, and similarly, we have only recently received agreement from the French government that we could bring Dubs cases to the U.K. Before that, we worked closely with the French behind the scenes, but without their agreement, it was not possible to make progress on taking nonfamily cases from Calais,” she said. U.K. Immigration Minister Robert Goodwill said that the U.K. is committed to safeguarding and protecting children in Calais. According to the Interior Ministry, the U.K. will contribute up to 36 million pounds (approximately $44 million) to maintain the security of the controls, support the camp clearance, ensure that the camp is kept closed and help keep children safe in France.